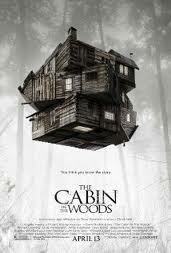 The plot was very simple and guess-able, horror movie with bunch of teenagers went to countryside to have fun in a cabin and then they died one by one because suicide. I was interested to buy the ticket when the ticket seller said this is zombie movie with comedy. Cool... i am gonna watch another Zombieland movie on the cinema. I had high expectation. Due all of my friends actually confuse to choose this movie, i said it would be fun to watch the movie. And then we went to cinema seat and start to watch movie. When i watched this movie,its too similar with previous "crunchy" horror movie, 5 teenagers went to a countryside to have their vacation. I got confused when the scene moved into an office that there were many monitors inside. Apparently, they were watching the teenagers to make a suicide plot by choosing the killer creatures based the stuffs they take inside the cabin. And of them accidentally choose a book which summoned Zombies around the cabin that would kill them one by one for sacrifice by the people on the office. If you see the plot, its too simple plot and its story plain ordinary. I was enjoying the whole movies by following the rules without thinking anything except the characters would be dead, but in the end of movie you'll see that there will be confusing surprises that please you as fan of horror movie. As a zombie movie fan, i was little bit disappointed because its not like my expectation... where were the funny scenes? The joke was oscillated around the character only, not in the zombie. Sometimes, during the movie i just took attention to one of my friend with his girlfriend, whenever horrible scenes happened, the girl just hold my friend hand tight* A moral lesson to me if someday i go with girlfriend to watch horror movie as long as the movie can shed the blood. I like final part actually.